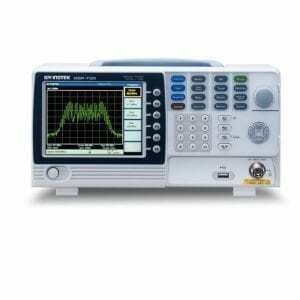 The GSP-830 Spectrum Analyzer, covering a frequency range of 9 kHz to 3.0 GHz, is designed to meet the demands of production or development tests of RF products, and maintenance or installation of on-site wireless communication systems. 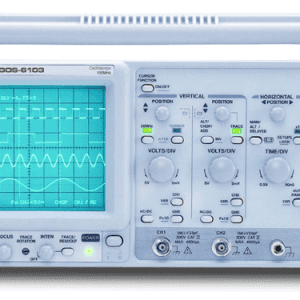 The exceptional price / performance, high portability, and easy-to-use design make the GSP-830 a very accurate and handy instrument for most RF measurement applications. The portability with AC/DC/Battery power operation, 4.8 kg weight, compact size, and 9 kHz to 3.0 GHz frequency coverage, makes the GSP-830 is a very convenient tool for the field service of RF systems. The internal memory can save and store 100 trace/set-ups making repetitive measurements with mass storage of test results possible. The large memory size also allows for measurement results to be saved in the GSP-830, and then transferred to a PC for further analysis. 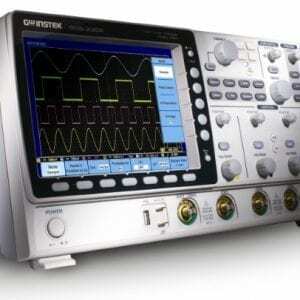 Utilizing advanced synthesizer-based design, the GSP-830 delivers accurate and reliable measurements. The remarkable performance of -100 dBm average noise floor and -100 dBm to +20 dBm wide input range, greatly extends the application range of the product. The ACPR, OCBW and CH power measurements make the verification of wireless communication characteristics simple and easy. The split window display simultaneously shows the spectrum in two separate frequency spans. 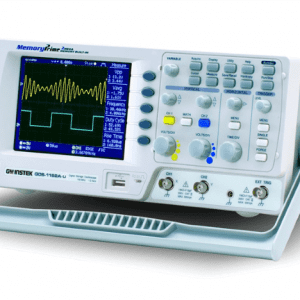 The optional built-in tracking generator with normalized output provides for performance testing of RF components and modules. 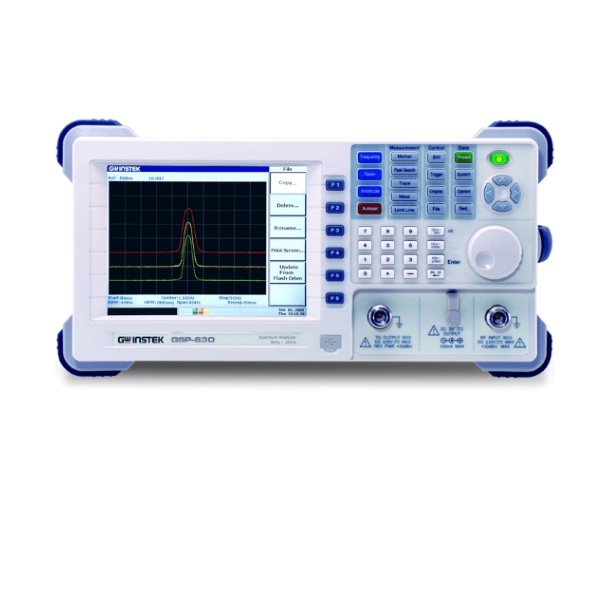 GW Instek now extends its spectrum Analyzer product series to 3GHz up. 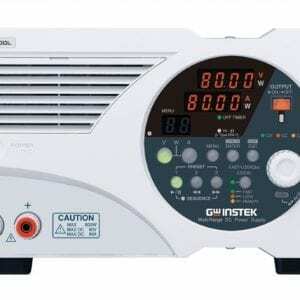 As a new member, GSP-830 inherits the advanta ges of high performance, low cost, easy to use and light-weight portability of GWinstek products. Moreover, its fabulous low noise floor greatly increases the measurement range; advanced user interface brings you significant visual distinction; rich measurement functions make your work simple and easy. 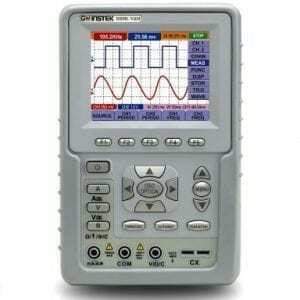 GSP-830 offers you the greatest performance-price value in the market. 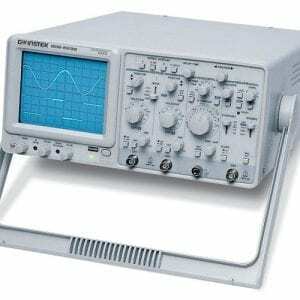 Wide Measurement Range – With GW Instek state-of-the-art design, GSP-830’s outstanding noise floor level, , presents extreme sensitivity for picking up weak signals. 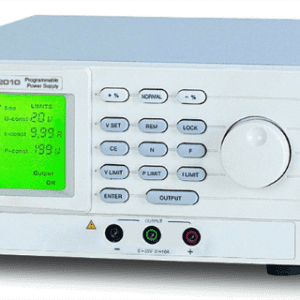 Along with GAP-810 10dB-gain preamplifier, GSP-830 reaches the equivalent noise floor level as low as 162dBm/Hz, thus widely extend the measurement range. 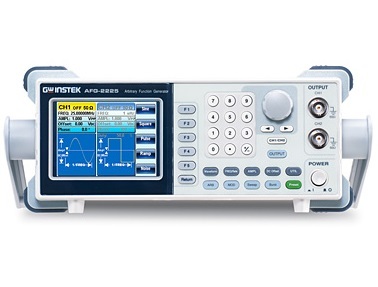 Automatic Measurement – GSP-830 can be an automatic test instrument without any external computer control. Users can define their own macros through a keypad on the front panel and store them into 10 Sequence sets. The sequence includes the steps of pause, so the running sequence could be stopped for measurement result observation then continue when necessary. Repeat or Single run modes can be selected based on the application requirements. Portable Power Operations – Equipped with two packs of Li-ion battery, GSP-830 could maintain its normal operation for more than 3 hours. The DC operation mode also allows GSP-830 to be powered by a 12-Volt power supply or the power of cigar-lighter inside the automobile. 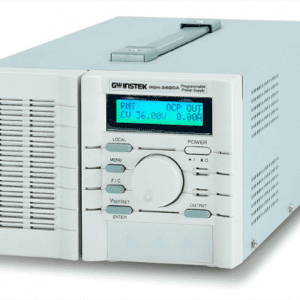 The large-size internal memory of GSP-830 helps store measured traces, setup information, limit lines and user-defined macros. Along with the USB feature to adopt the popular flash drive for mass storage, GSP-830 is a convenient tool for the service engineers. With only 6kg light weight and compact size, GSP-830 well fits into outdoor applications. Advanced User Interface – The user-oriented interface design of GSP-830 gives you the pleasure of handling a complicated job with ease. A high-resolution 6.4″ color TFT LCD provides high quality image display. Multiple traces with different colors, as defined by the user, facilitate the visual recognition of small disparities at a glance. Split window mode delivers the value for monitoring two different frequency bands on the same display at the same time. GSP-830 under this split-window mode acts like a product of two-spectrum-analyzers-in-one. 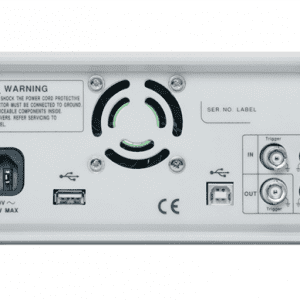 Feature-Rich Interface – The front panel USB host connector supports the ubiquitous flash drive for various transactions, including setup info, trace data and display images. In addition, it also supports the direct screen printout for the printers with USB ports. The rear panel USB On-The-Go, or OTG, connector plays the dual roles of both host and slave. As a slave, it gives accessibility to the remote control from PC. The display image of GSP-830 could be sent directly to the external monitors through a VGA port on the rear panel. This gives convenience for the remote monitoring at EMI test sites or the circumstances needing presentation or group discussion. 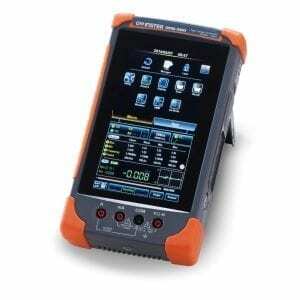 Free PC Software for GSP-830/GSP-827 – Through RS-232 or USB connection, EagleShot transfers the measurement data from GSP-830 to the PC. Users can print out the data in graphical format directly or save them into text file for further data analysis. With EagleShot software, the Limit Line setting on the PC could be done either through capturing the setting from GSP-830 or through the Limit Line editing by the user at the PC end. 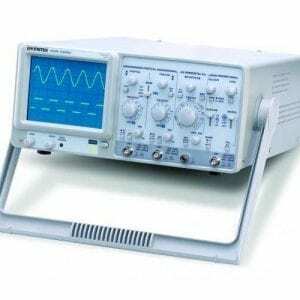 For marking and reading the measured signals on the PC screen, users can place markers to the peaks of their interest on the display, as easily as they do on GSP-830. The new EagleShot PC software supports both GSP-830 and GSP-827 in various application field.